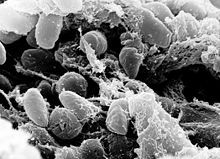 Yersinia pestis (umwhile Pasteurella pestis) is a Gram-negative, rod-shapit coccobacillus, a facultative anaerobic organism that can infect humans via the oriental ratton flech. It causes the deidly disease cried bubonic plague (or "the plague" colloquially). ↑ Sutyak, Katya. "Yersinia Pestis." University of Connecticut. University of Connecticut, n.d. Web. 10 Nov. 2015. ↑ Ryan KJ, Ray CG, eds. (2004). Sherris Medical Microbiology (4th ed.). McGraw Hill. pp. 484–488. ISBN 0-8385-8529-9. This page wis last eeditit on 11 Mey 2017, at 02:01.